Tanna of the first and second centuries. It appears from B. B. 10b that Neḥunya was a contemporary, but not a pupil, of Johanan b. Zakkai. He was the teacher of Ishmael b. Elisha. Neḥunya was rich and had a large retinue of servants; but he was distinguished for his meekness and forgiving nature, to which he attributed his attainment of great age (Meg. 28a); two short prayers composed by him exhibit the same qualities (Ber. iv. 2; Yer. Ber. iv. 2). According to the statement of R. Johanan (Shebu. 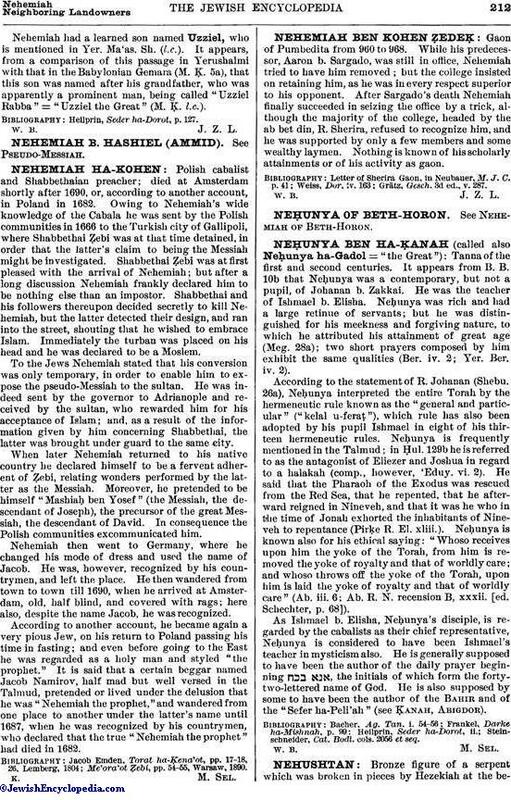 26a), Neḥunya interpreted the entire Torah by the hermeneutic rule known as the "general and particular" ("kelal u-feraṭ"), which rule has also been adopted by his pupil Ishmael in eight of his thirteen hermeneutic rules. Neḥunya is frequently mentioned in the Talmud; in Ḥul. 129b he is referred to as the antagonist of Eliezer and Joshua in regard to a halakah (comp., however, 'Eduy. vi. 2). He said that the Pharaoh of the Exodus was rescued from the Red Sea, that he repented, that he afterward reigned in Nineveh, and that it was he who in the time of Jonah exhorted the inhabitants of Nineveh to repentance (Pirḳe R. El. xliii.). Neḥunya is known also for his ethical saying: "Whoso receives upon him the yoke of the Torah, from him is removed the yoke of royalty and that of worldly care; and whoso throws off the yoke of the Torah, upon him is laid the yoke of royalty and that of worldly care" (Ab. iii. 6; Ab. R. N. recension B, xxxii. [ed. Schechter, p. 68]). As Ishmael b. Elisha, Neḥunya's disciple, is regarded by the cabalists as their chief representative, Neḥunya is considered to have been Ishmael's teacher in mysticism also. He is generally supposed to have been the author of the daily prayer beginning , the initials of which form the forty-two-lettered name of God. He is also supposed by some to have been the author of the Bahir and of the "Sefer ha-Peli'ah" (see Ḳanah, Abigdor). Steinschneider, Cat. Bodl. cols. 2056 et seq.